The Samaria District Military Court on Tuesday convicted Hakim Awad, an 18 year old Arab from the village of Awarta, for the murders of the five members of the Fogel family in Itamar. 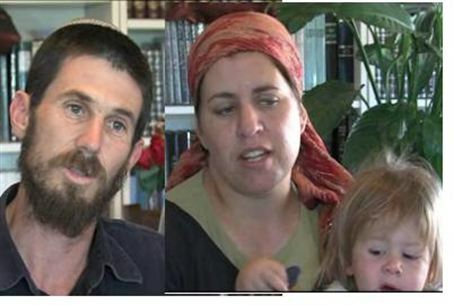 Awad confessed to murdering Udi (36) and Ruti (35), the two parents, and their three children, Yoav (11), Elad (4), and baby Hadas (three months), in the March 11 terror attack. Hakim Awad, along with fellow terrorist Amjad Awad of Awarta were formally charged with five counts of intentionally causing death – the military court’s equivalent of murder charges. They were also charged with stealing weapons, breaking and entering and conspiracy to commit a crime. The IDF said that Hakim Awad had confessed to all the charges against him. Awad was 17 when he carried out the attack, a high school student studying in his home village. Awad identified with the Popular Front terror group; his uncle had been a member, and had carried out at terror attack in 2004, murdering the security officer of Itamar, Shlomo Miller. Awad's accomplice, Amjad Awad, is 19. Shin Bet investigators said that the two had entered Itamar through a hole in the fence surrounding the town with the intention of murdering Jews. They attempted to acquire guns, but when they were unable to they decided to carry out a stabbing attack. The terrorists first stabbed the children Yoav and Elad to death, and then killed the parents Udi and Ruti after a struggle. They managed to get hold of a weapon belonging to Udi Fogel, and shot him and his wife after stabbing them. The two then left the house, the Shabak said, leaving the infant Hadas unharmed. They returned to the house a few moments later to steal a second weapon – and at that point decided to kill Hadas, stabbing her to death, investigators said. Sentencing will be carried out at a later date. The court will consider the case against Amjad Awad on August 16.